What is fotoBiz X? Beyond simple photography bidding and invoicing. 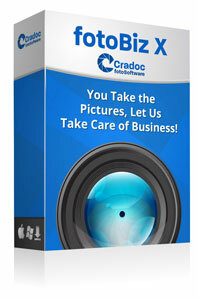 FotoBiz X is the most powerful, affordable and easy to use photography business management software available. The fotoBiz X program sets a new standard for photo business management software. 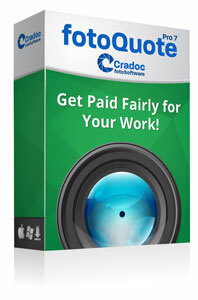 FotoBiz X gives you a complete set of tools that go beyond simple photography bidding and invoicing. Everything about fotoBiz X is designed to save you time and keystrokes. FotoBiz takes just about everything you hate about the business end of your profession and does it for you in a simple and elegant way. You look professional and responsible, even when you are pressed for time. 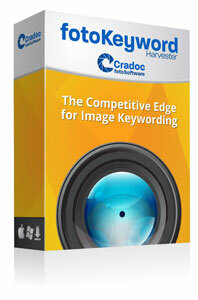 Organize your business, get your paperwork out, track image sales and stay on top of expiring image licenses. It is all easy to do with fotoBiz X. In the same way a workflow is important for you to deal with the organization of your images, a business workflow is critical for you to stay organized with the details of your photography business. 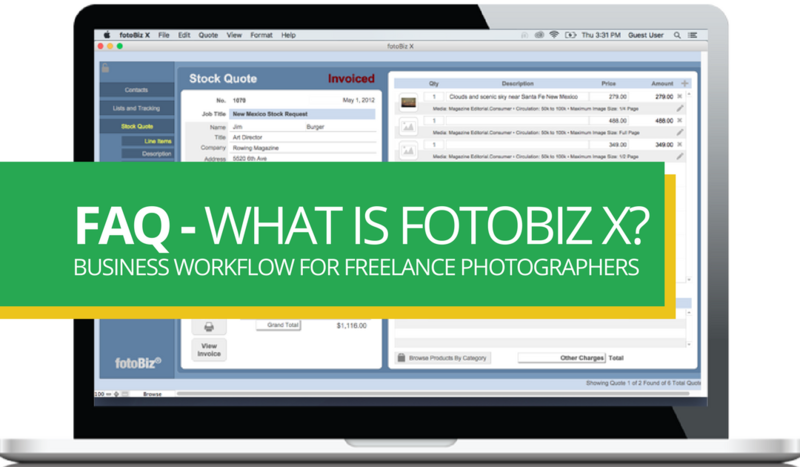 With fotoBiz X you get the workflow that lets you quickly and easily create stock photography quotes, assignment estimates, stock and assignment photography invoices and more, including image sales and license tracking. FotoQuote Pro 6, the industry standard pricing guide for stock and assignment photography, is built-in to fotoBiz X. Research photo or video prices and, with the click of a button, automatically add the pricing information and licensing language to your assignment estimate, stock quote or invoice. What Makes fotoBiz X Unique? The feedback we’ve been getting from customers is that fotoBiz X does so much more than other business management programs. Watch this short video for an overview of fotoBiz X. No matter what photography business software you’ve looked at before, you’ve never seen anything like fotoBiz X, an indispensable tool for anyone working with images. With fotoBiz X and fotoQuote Pro you get all of the tools you need to be paid fairly for your work, to create the paperwork that protects both you and your client, and to excel in your photography business! I use 2 computers in my business. If I were to buy FotoQuote or PotoBizX would I be able to put them on both computers without an additional charge? Good question Jim – I have the same situation and would like to know prior to purchase. Hi Mary, yes – the programs can be installed on more than 1 computer at a time. They do not “talk” to each other, synch or share information. They are 2 completely separate installations. Yes Jim, you can install on 2 computers. Get Ready To Grow Your Photography Business in 2019!